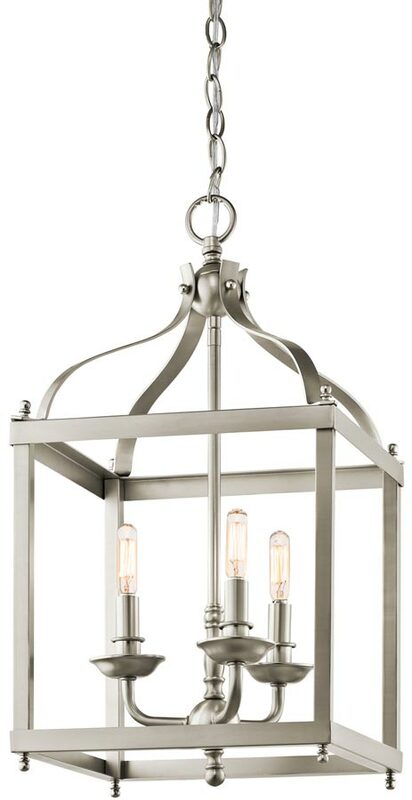 The Larkin brushed nickel 3 light medium sized hall lantern by Kichler creates a strong, linear silhouette. The brushed nickel finish, steel form and open sides of the design will effortlessly accent your home. The picture shows this lovely lantern fitted with Edison squirrel cage light bulbs that are not supplied. 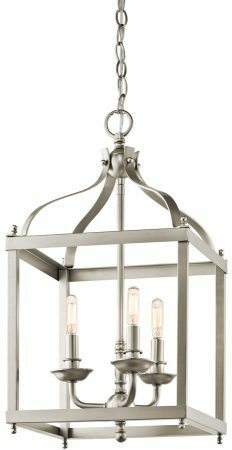 A superb quality medium hanging hall lantern, with a simple 15cm brushed nickel ceiling mount and chain suspension supporting the open lantern by four double curved bars. A central drop rod carries the three lamps fitted with brushed nickel candle sleeves, surrounded by the open framed lantern body. Supplied with 183cm of chain and cable that can be shortened at the time of installation. Please see the technical information below for exact dimensions. Please note: This lantern is delivered flat-packed and requires assembly. It can easily be put together by one person in around 15 minutes without the use of any tools. Please follow this link to download or view the assembly instructions that show what is required. Supplied by Elstead Lighting and designed in the USA by L.D. Kichler & Co, a family run business held in high regard for their diversity of design and breadth of range, which includes some truly striking contemporary and substantial light fittings such as the Larkin brushed nickel 3 light medium sized hall lantern you see here.